And if not, please humor me. Hazy sunshine trying to break through this morning. I love winter, but I’m ready for it to be over so I can go outside without wearing eight layers of clothing. Hello, Sunshine, indeed! It finally broke through! I could carry travel costumes for the entire crew of the von Trapp Family Singers in the bags under my eyes this morning. Long week. Happy Friday everyone! Me watching any Olympic event: WOW! That was amazing!! So great! Commentator: Wow. What a devastating mistake for this athlete. That is not what you want to see, folks. No chance of a medal now. I was walking to my car at the end of a busy, stressful day when I passed by a random person who was playing a beautiful classical song on the piano in the atrium. Thank you, random person, for reminding me to stop and take a deep breath. My life will henceforth be divided into the time before and after I realized the lyrics to the theme from St Elmo’s Fire are “all I need’s this pair of wheels” not “underneath this pair of wheels”, a turn of phrase I always found puzzling. Stationary bike. Only one mile in five minutes, but I didn’t want to do it at all, sooo victory! 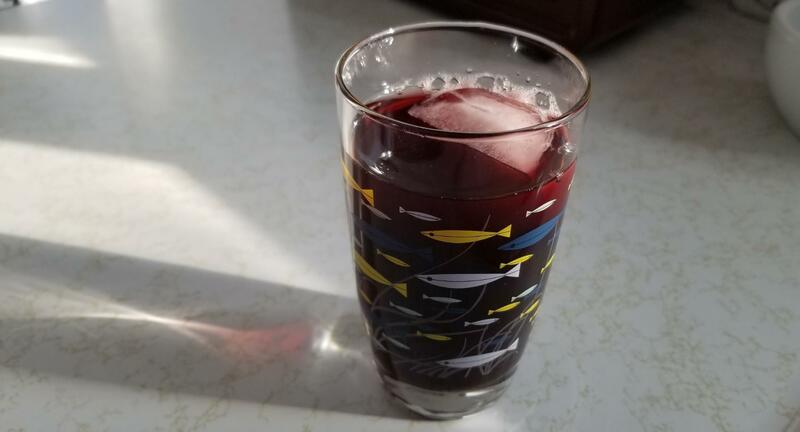 Morning grape juice in my fish glass. Little Daing, it’s been a…. FRICKING OUTRAGEOUSLY HOT WINTER HERE…! Haha! I ALWAYS enjoy “cool” days. It’s the weeks long stretches with wind chills below zero that are getting old. 😉 I certainly have no interest in the temperatures you folks have been having. Too hot for my blood!! We do that here, too! So amusing!! Anything they do in ice skating or skiing or any winter sport seems amazing to me, because I certainly can’t do it!! Enter your email address to follow Maybe You Can Relate and receive notifications of new posts by email.